thecyclingdiva – Page 3 – My life. 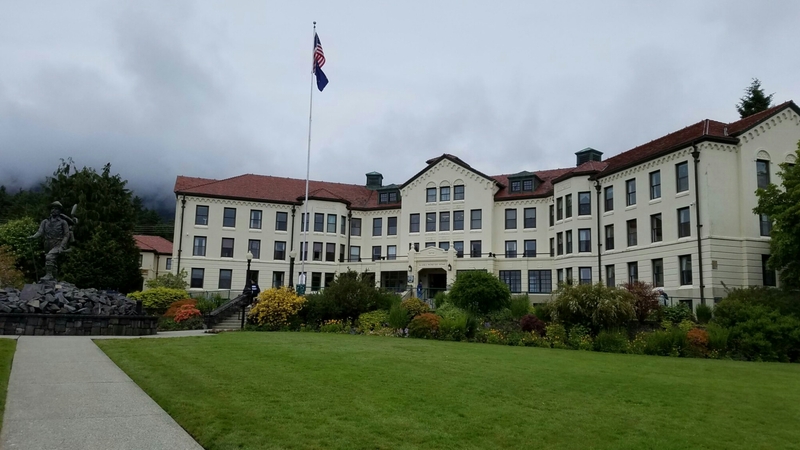 Since most of our stuff had to be packed last night and set out for staff to take, we had a small case for last minute items and the clothes we’d worn yesterday. Made it to breakfast before the dining room closed then it was sit and wait. We went to the wrong room but Jim and Barbie were there so we visited with them until it was time to move to the correct waiting room. As we walked toward the correct room, Wayne and Tony hailed us. We all went to wait together. Our color and number was called so we were released to leave the ship and go find our luggage. In order to get out of San Fran before traffic got worse (it was a Friday remember), we decided to all walk with the luggage to the car park. Got lost along the way but eventually found the correct garage and the vehicle. Made it home without too much traffic delay. So nice to be back. The penultimate day is here. I had another bad night so really felt beat up this morning. In spite of that, I got up and did our laundry. Then Dan and I went to the buffet for breakfast. I wasn’t too interested in eating but did have some granola and a carrot muffin, ok I had two muffins but they were small. Then we sat on the upper deck and watched the ocean hoping to see whales, dolphins, or some other sea critters. Thought we saw some spouting but didn’t see any animals. Today’s weather was sunny and pleasant. I soon started to fade so left Dan and went to take a nap. The nap helped. I felt better and we went to our last dinner with our new friends. 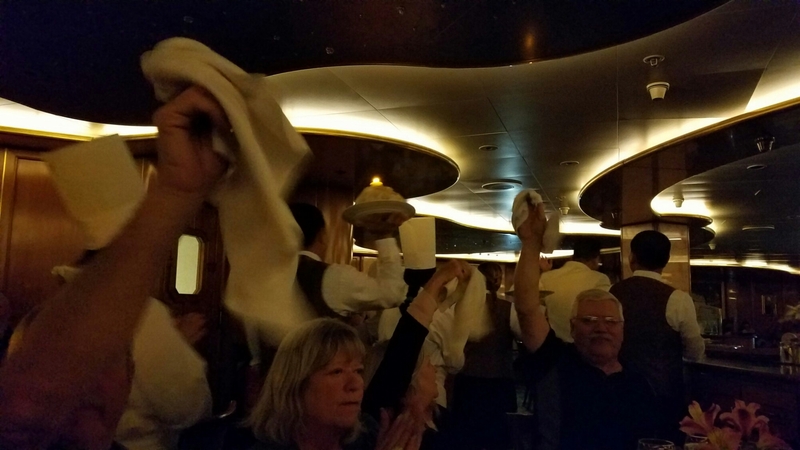 Several people ordered the baked Alaska and the entire wait staff, cooks, etc did a parade carrying some of the whole dessert on plates with candles. We’ve become friends with our waiter, Carlos, and his assistant, Herman, too. Goodbyes and hugs. Jimmy, our room steward, has been so positive and pleasant. Another friend to add to our list. We have packed and our luggage is waiting in the hall for the staff to take it away for tomorrow’s departure. Hope I sleep well tonight. 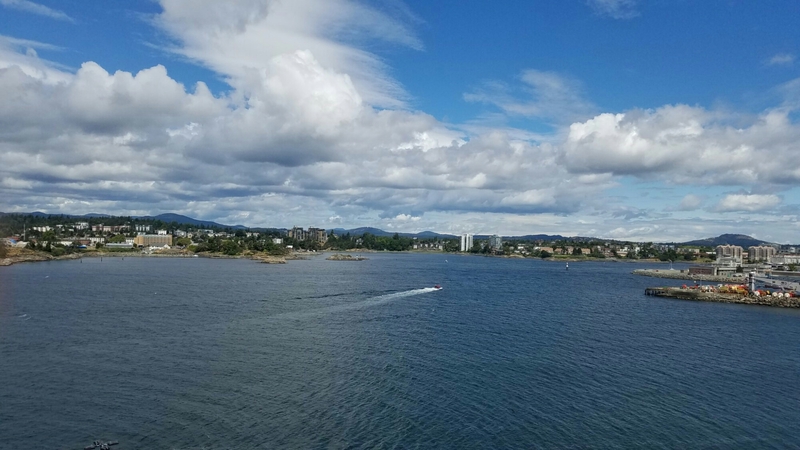 This morning we got out fairly early, bought a bus ticket and took a ride into downtown Victoria. Someone said its a rule that these cruise ships must go into a foreign port on each trip so this was it for us. 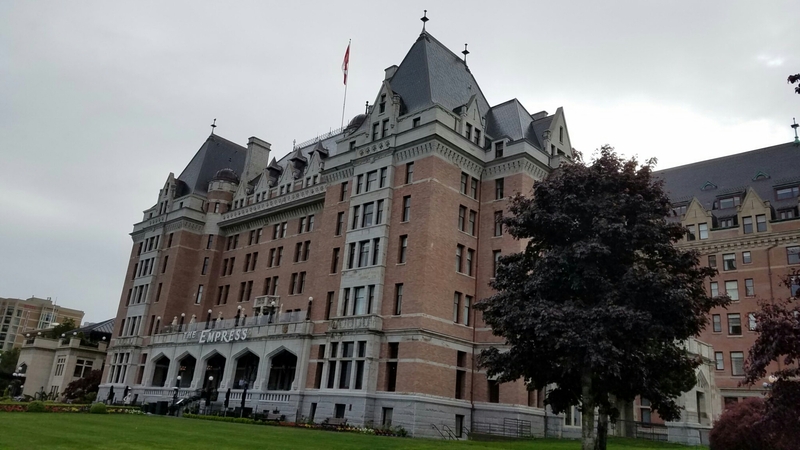 We were dropped off right by the Empress Hotel so we walked through and admired the architecture and the grounds. 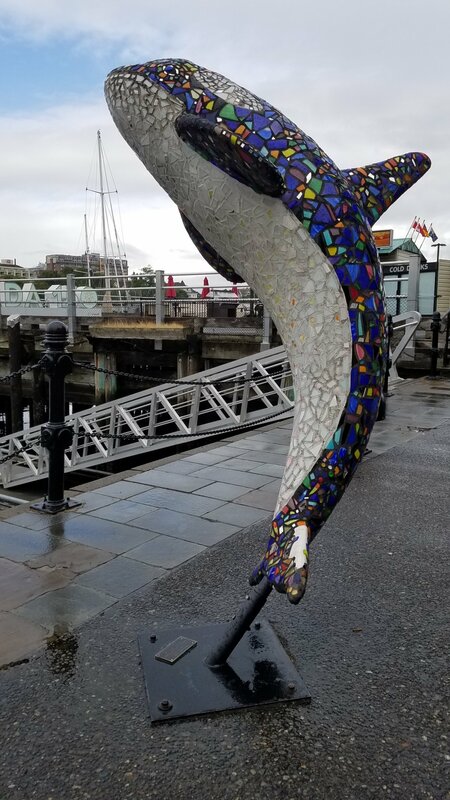 I saw several dolphin sculptures. 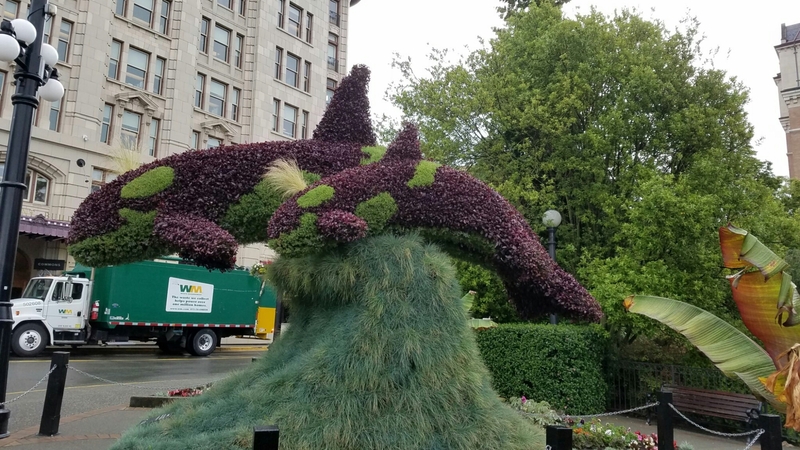 Some were plants trimmed to look like dolphins. Others reminded me of the frogs stationed all through Calaveras County. Mother and baby sculpted into the shrubbery. One of several dolphins decorating the area. 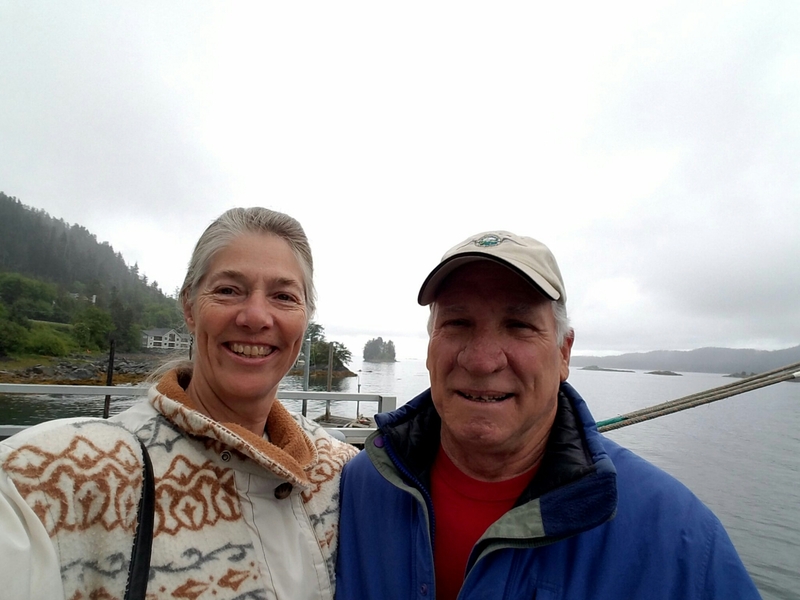 Since we hadn’t had breakfast before leaving the ship, we stopped at a little coffee shop for a bite. I ordered the Earl Grey tea and was very pleasantly surprised at how good it was! I should have asked if I could buy some tea but didn’t think of it until later. Sigh. Right across the street from our breakfast spot, there was a Giant bicycle shop. Of course, we went it to look. The young salesman was very chatty. So he and Dan jawed while I looked around. 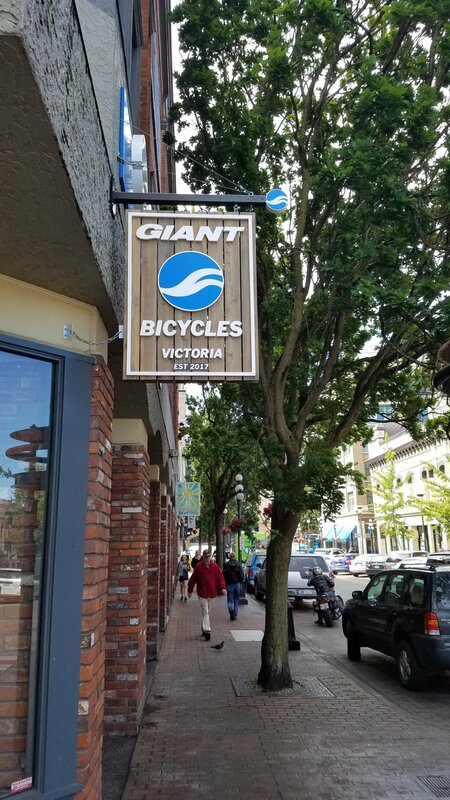 They sold Giant brand cycles here. 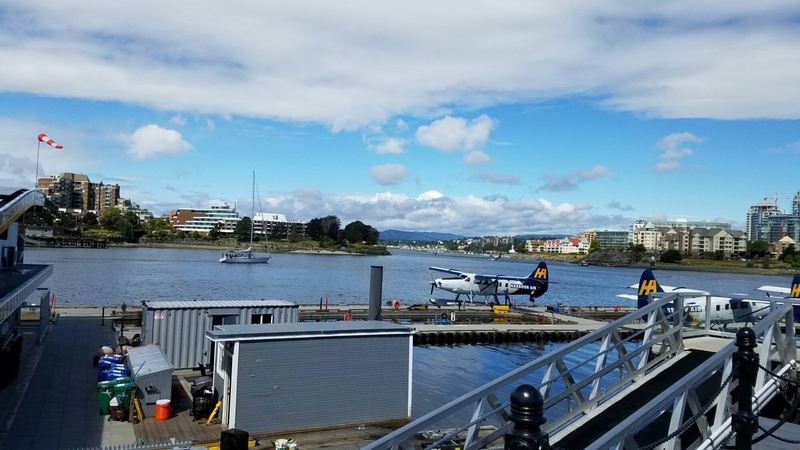 We wandered down to the harbor and, lo and behold, there was a seaplane base! A sailboat happened by too. It turned out to be a nice day with sunshine so several folks were out enjoying it. Planes and boats share the same waters. The day had started with drizzle but that ended, the sun came out and it must’ve warmed up to 50 degrees. The wind never died down but as long as we stayed in protected areas, it wasn’t too cold. Finding the bus stop for our return trip concerned us a bit because the bus driver gave us one set of instructions but the man at the visitor’s center said something different because of construction that was going on in town. Fortunately we walked down the correct street at the correct time and caught the correct bus. 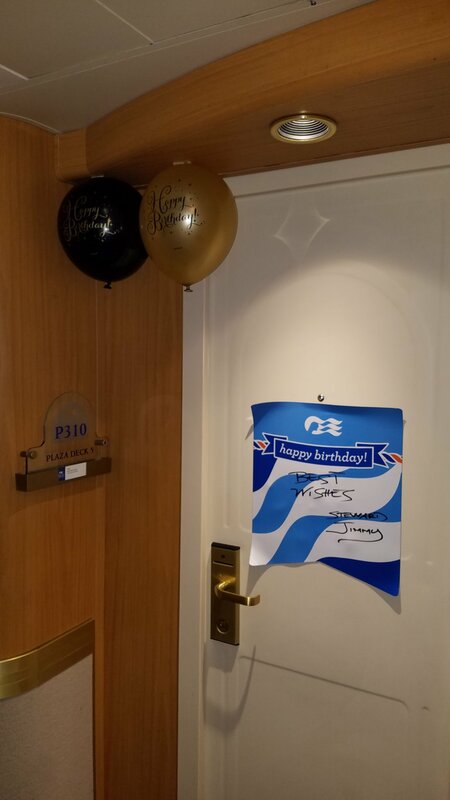 Returning to our room, there was a “Happy Birthday” sign on the door with balloons. 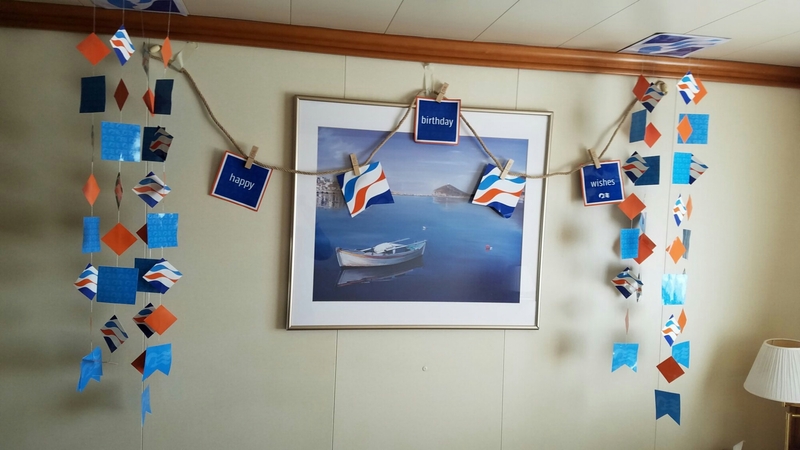 The room had also been decorated. It was fun seeing Dan surprised. 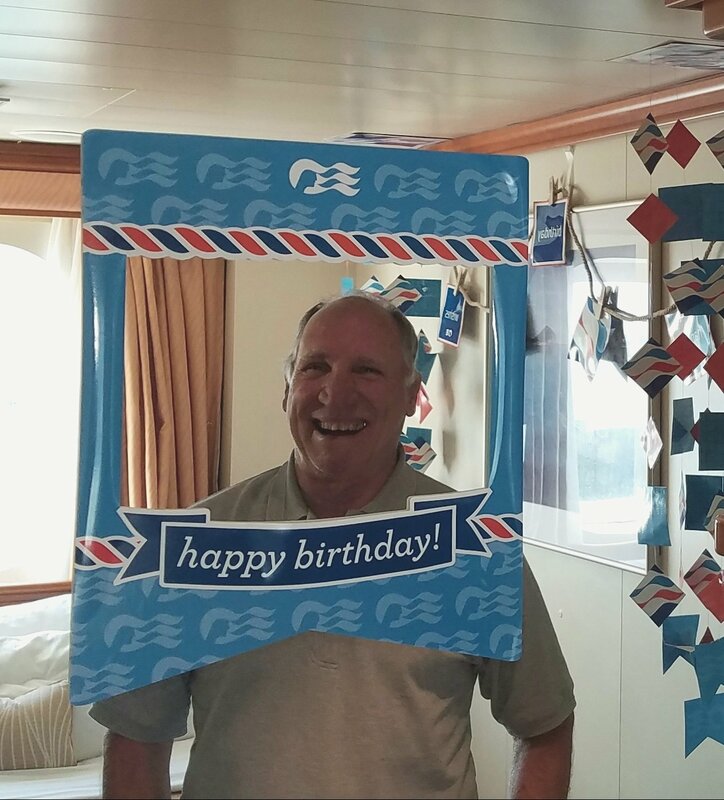 Princess Cruises had given Dan a $50 gift certificate to be used in the spa. So he decided to get a haircut. He ended up getting that, a facial, a shave, and an arm and hand massage. Now he looks younger than me. Since there were two birthday boys in our group, we decided tonight would be the celebration. 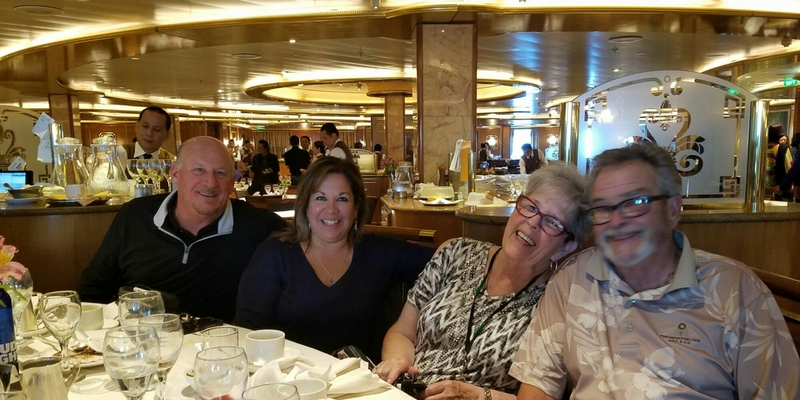 Turns out there is another couple that live in Pine Mountain Lake who are also on the cruise, Rich and Marsha. So they joined us and that made three June birthday boys: Todd, Dan, and Rich. The travel agent gave us this evening’s special dinner as a gift which was very nice! Our waiter, from Serbia, was a hoot. He told us his name but said to call him Mr. B as that would be easier to remember. We were all able to sit at the same table and we all had a fun time teasing one another, telling jokes and enjoying a delicious meal. Time for bed. Tomorrow is another day at sea but we should have tail winds and not such a wild ride as yesterday. Spent the evening watching Nathan Foley. Good entertainer! Was his second show on board. We’d seen him before so were sure it’d be a good show. Then, for a total change of music, we went to the classical music presentation by a trio from Hungaria. They are excellent musicians but the violinist! Wow!! The trio, Rhapsody Strings Trio, have played many times during the cruise and they are GREAT. Paid for the naps later as I couldn’t fall asleep. It was well past midnight when I did and then it was the sleep where you don’t feel like you’re really sleeping. But I woke up at 6:30…half an hour before the alarm was set to go off. 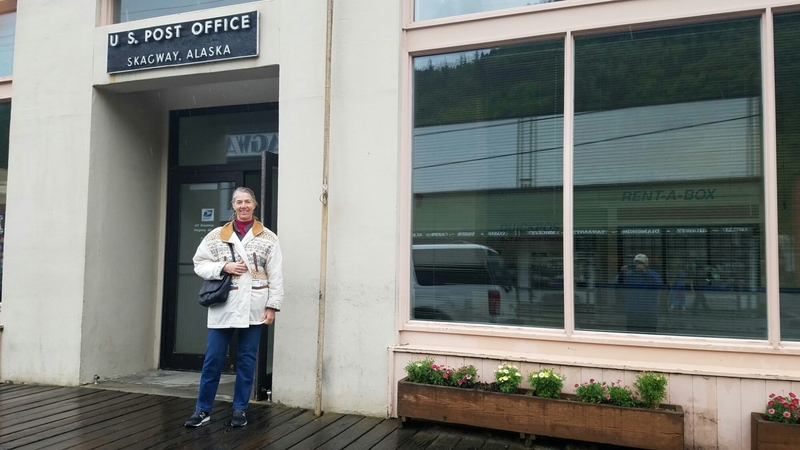 The largest in land area and the first town in Alaska settled by the Russians. 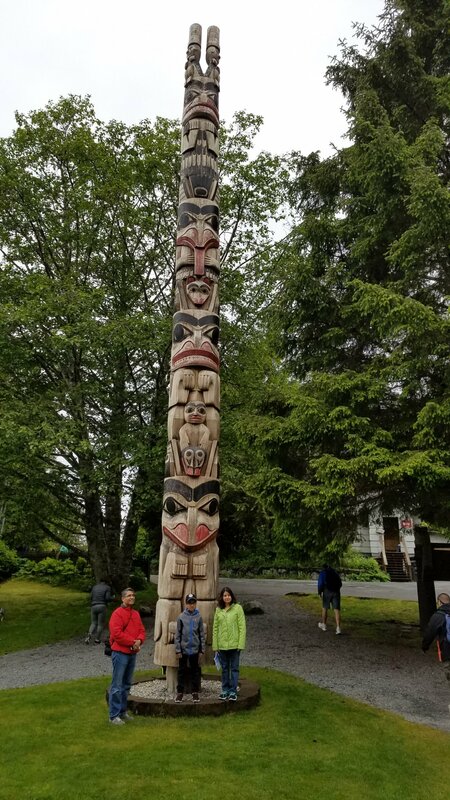 Of course, the Tlingit had been here for thousands of years before the Russians showed up. We were only given half a day to explore the area. Took a bus into town which would have been a five mile walk. This really is a large town, all the others have been about one mile from end to end. 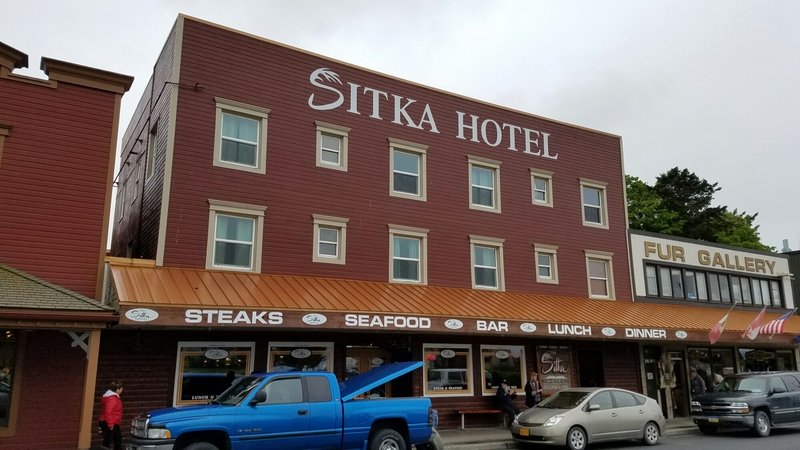 Dan wanted to sit in an Alaskan bar and order a beer. So we found one but couldn’t stand the smoke. We went to another which also was a restaurant where there was no smoking. I’m guessing the rules here are smoking allowed in bars but not in restaurants. Then he ordered a gin and tonic. (Has to try to stick to the “no bread” diet as much as he can – wink, wink). Turns out our bar mate was another passenger from our cruise. There was a bar here. That counts. We stopped at a fur store. Wow! They are sooo soft. Thought about getting the dolls dressed up in native attire for grandkids but don’t think they are old enough to appreciate them. Maybe next time. Stopping at St. Michael’s Cathedral was almost a requirement. It is the first church built in town, Russian Orthodox. 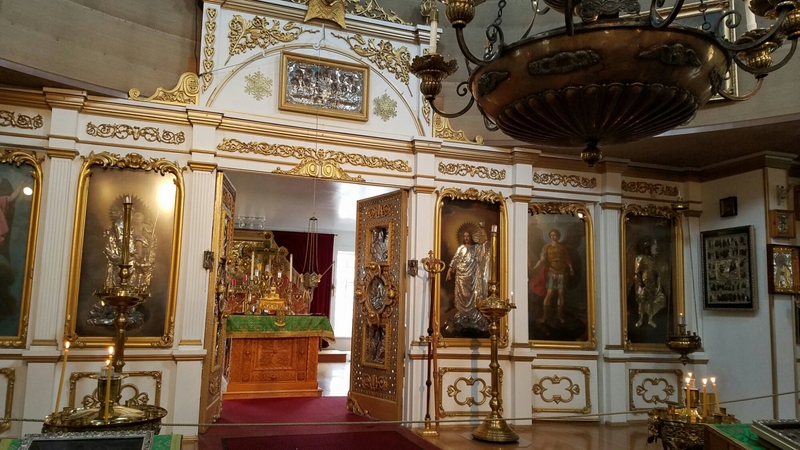 Although it was small inside, it was VERY ornate. 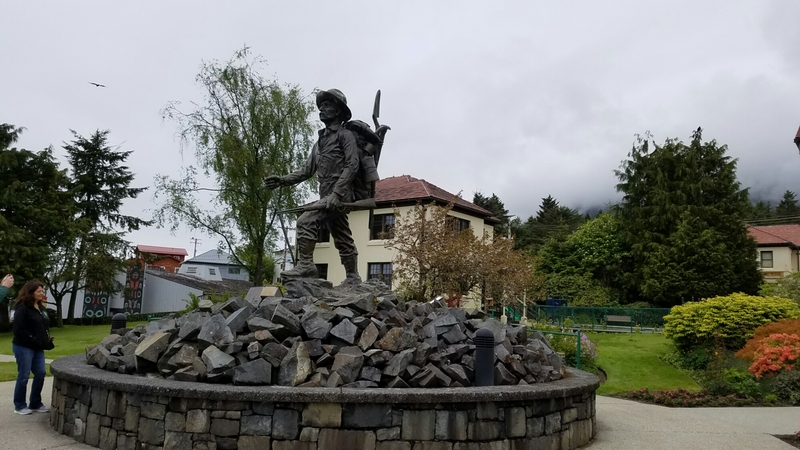 Got some photos of the Alaska Pioneers Home with statue of prospector out front. Then we headed for the other end of town and enjoyed the “sea walk” which took us along the harbor where we heard song birds and saw some interesting flowers. Enjoying walk by the sound. 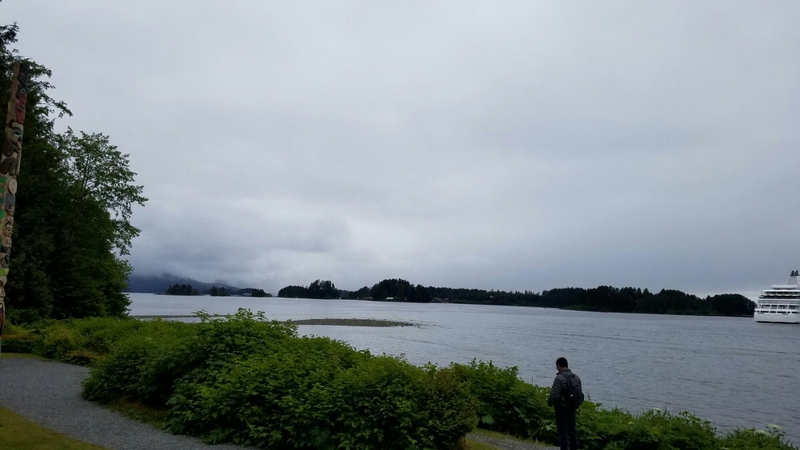 At the end of the walk was the Sitka Sound Science Center. Not sound as in hearing but sound as in a harbor. I had to have that explained to me. Doh! 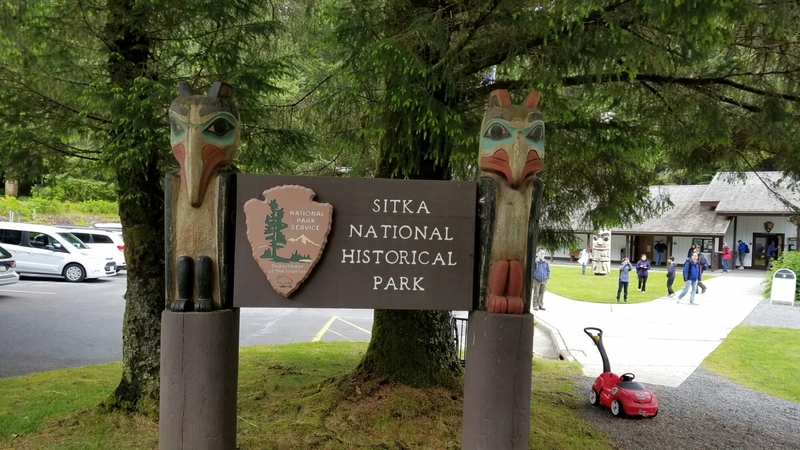 We visited Sitka National Historical Park with its totem poles and museum. 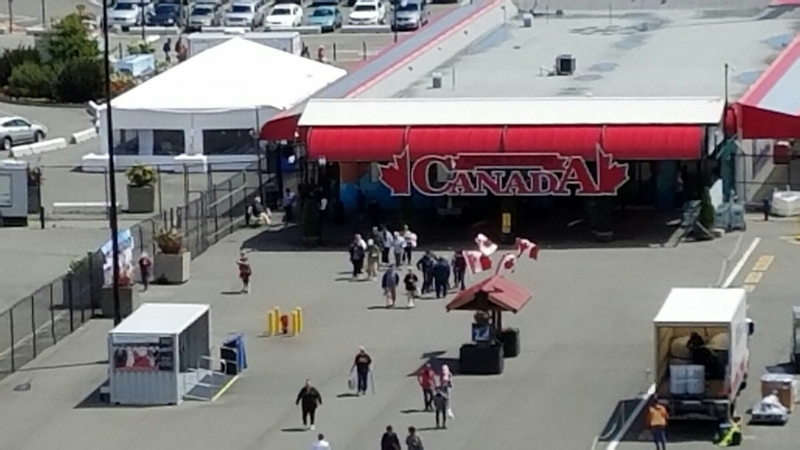 Other visitors were by the pole which provides good perspective on its size. 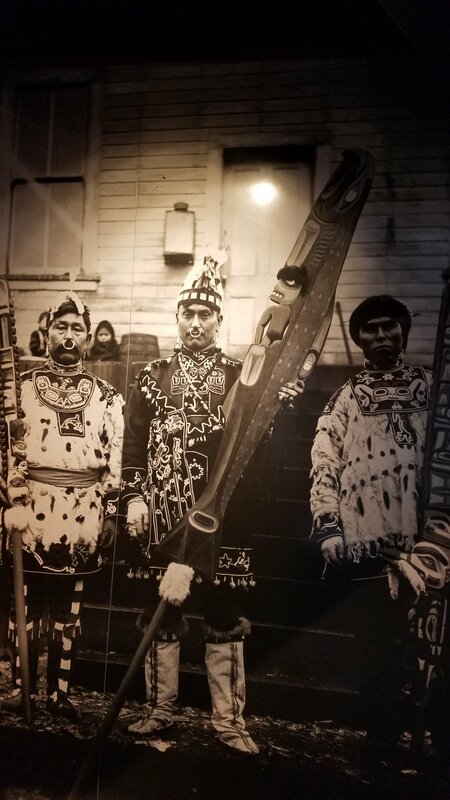 Photo of the Tlingit native to the area. 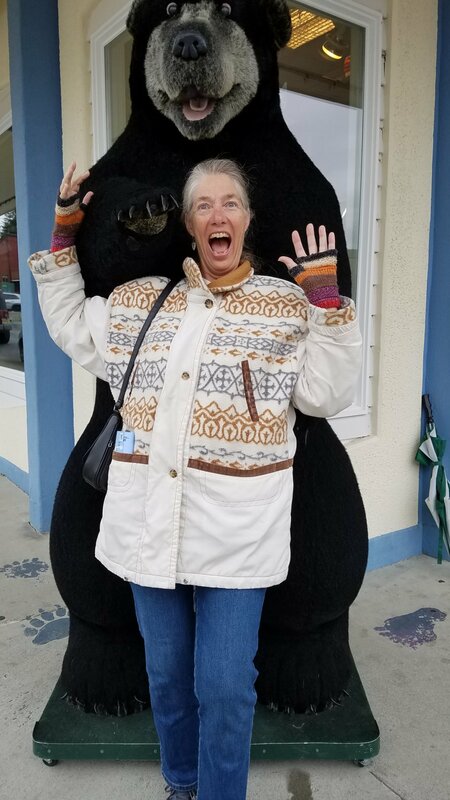 I was attacked by a bear in the downtown area! 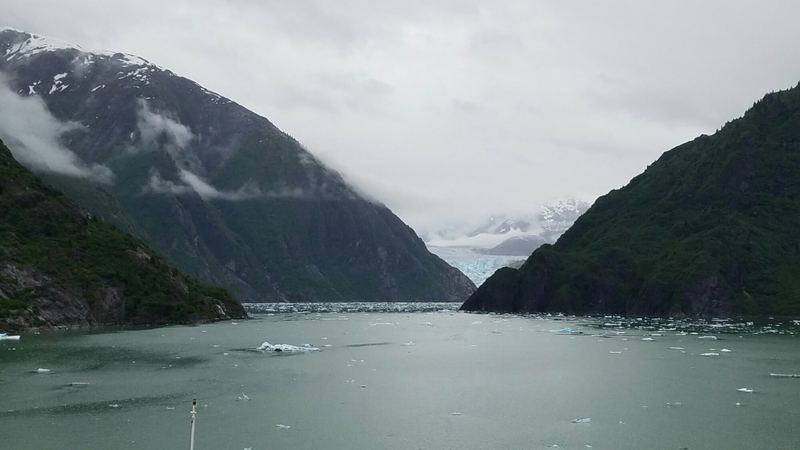 Woke up anticipating the visit to Tracy Arm Fjord and Glacier. 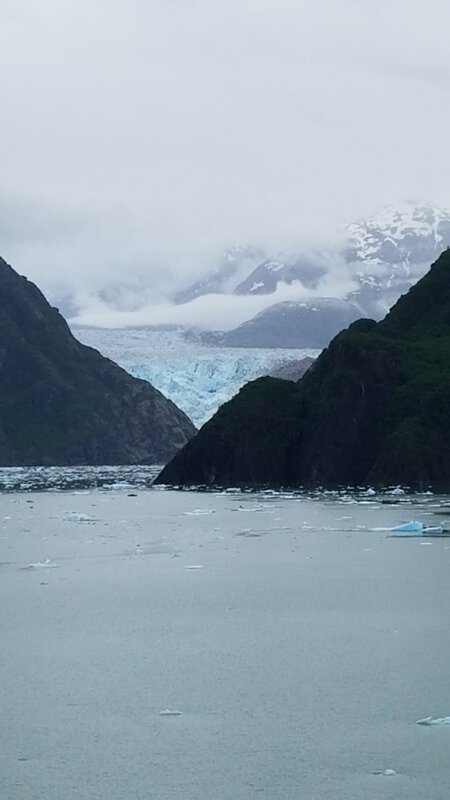 The area is spectacular. The mountains remind me of Yosemite. Aha! 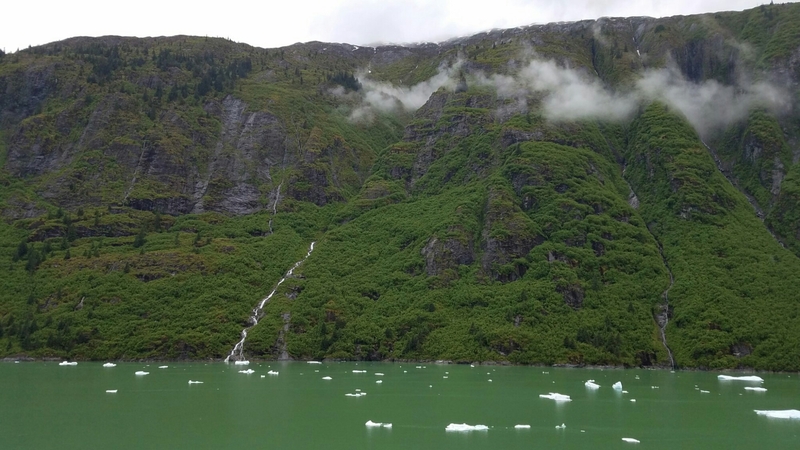 The area is nicknamed Little Yosemite according to the info received from the cruiseline. Granite with greenery and lots of waterfalls were what we saw.. As we got closer to the glacier, the ice flows got heavier. 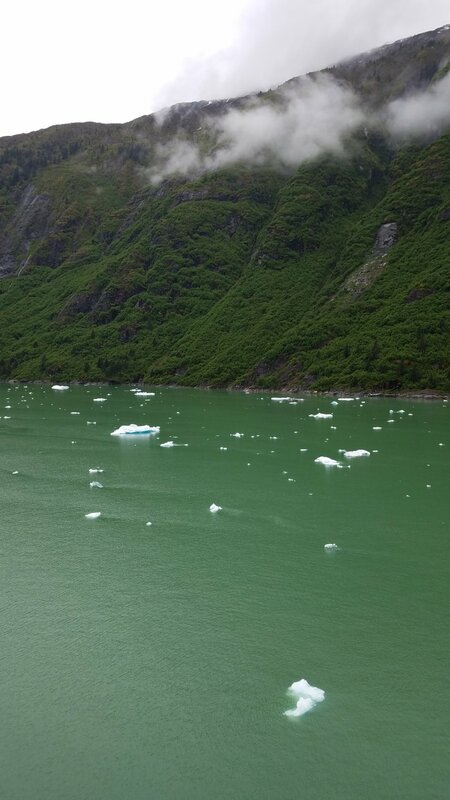 I was disappointed we did not get very close to the glacier and did not see any calving. Very disappointed as this was the main reason I wanted to come on the cruise. We did sign up for a wine tasting class which was this afternoon. Guess I’m not really that interested because there was lots of information provided along with five different wines. Meh. 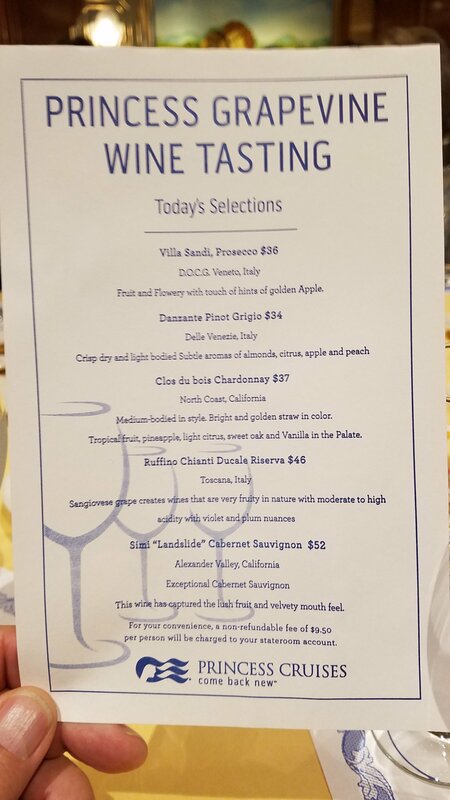 Wine menu – my favorite was the Chianti. Dan preferred the Cab. Down time again until dinner. I’m beginning to wonder why people are so enamoured of cruises. The entertainment at night is very good. Enjoyed a singer and a comedian this evening. That’s a plus for the cruise. The ship left port around 10 last night. We were watching another show and didn’t even feel the ship moving. Dan is feeling worse so we went to the cabin and crashed. 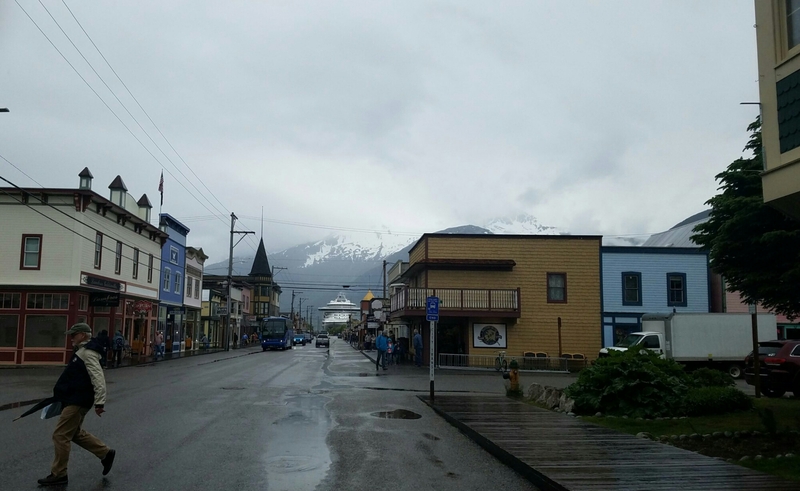 When we finally climbed out of bed, we were in Skagway. Weather today, overcast and drizzly. After a light breakfast, we wandered into town searching for WiFi. Found it at the local library but many, many others were using it too so it didn’t work well. I still cannot load my pictures onto this site so no publishing yet. Dan wasn’t doing well so he went back to the ship while I stayed at the library. Before Dan went back to the ship, we stopped at a few stores. Saw some beautiful knives. The handles were made from mastodon teeth. Who would have thought a tooth could be so pretty. Also stopped at Sockeye Bicycles. 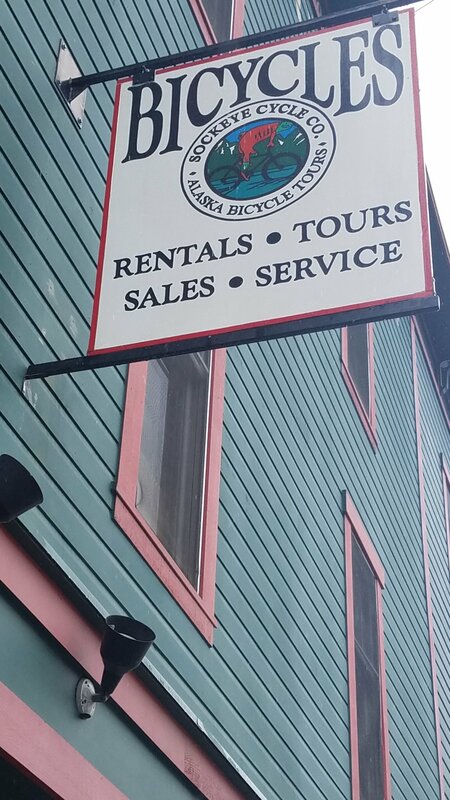 They not only sell bikes and bike related items but also run tours. I thought I’d seen the name before. They advertise in Cycle California. After hiking back to the ship, did lot of nothing waiting for the dinner hour. Most of our group was there so we caught up on the various adventures. A new comedian kept us laughing for awhile. That was all Dan could take so he went to lie down. I wandered off to watch Girls with Guitars. A decent show. After that I stopped in to listen to karaoke. When the first singer got up to try it again, I was outta there. The ears can only take so much.